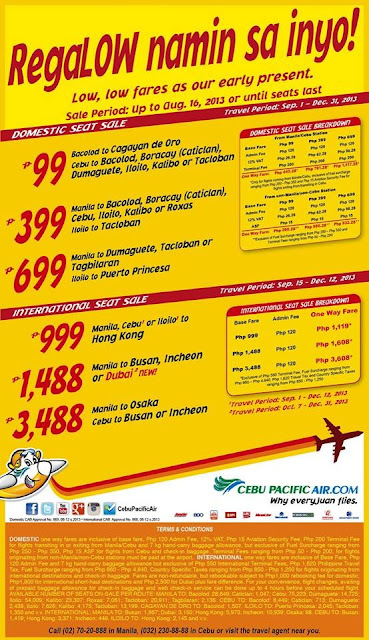 Cebu Pacific Promo Fare: RegaLOW Namin Sa Inyo! Low, low fares as our early present! Lowest fare is at P99 that you can get with destinations like Bacolod to CDO, Cebu to Bacolod, Boracay, Dumaguete, Iloilo, Kalibo or Tacloban. Lowest fare is at P999 with destinations like Manila, Cebu or Iloilo to Hong Kong!